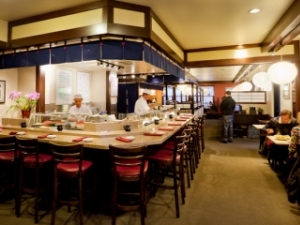 Even when I first stepped foot through the doors of Kyoto Japanese Restaurant – nearly some fourteen years ago – the restaurant was already one of the most popular restaurants in SLC, careering towards two decades of success. As a stranger to Japanese cuisine, Kyoto’s longevity gave me the confidence to step outside my comfort zone. Under the tutelage of the exceptionally friendly sushi chefs like Mike, Augi and Akira I tiptoed from California rolls (yes I can hear you at the back snickering, pipe down!) to sobbing uncontrollably when the kitchen ran out of Ankimo. I tasted my first uni at Kyoto, my first mussel shooter with raw quail egg. I ate deep fried fishy skeletons and was offered baby crabs, that only seconds prior were scampering around the kitchen, flash fried to my command. 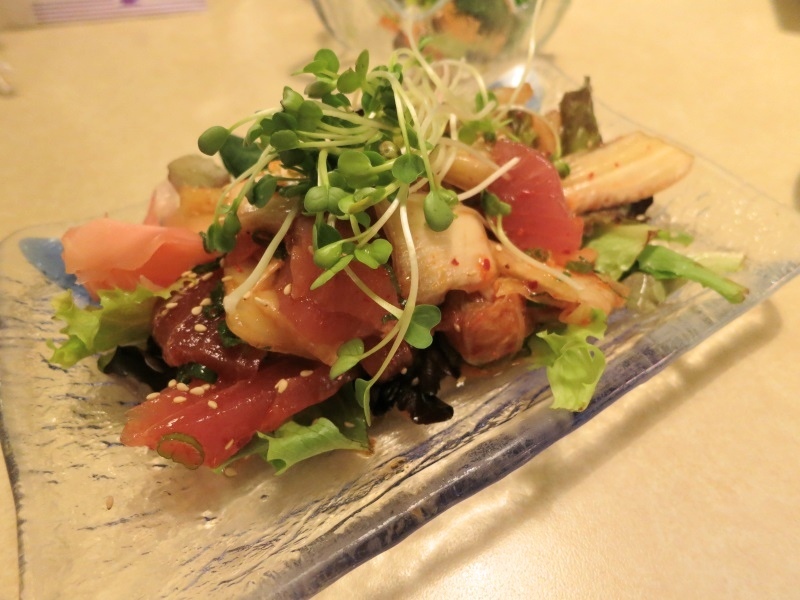 Collar bones, cheeks and more – I fell truly, madly, deeply in love with Japanese cuisine at Kyoto and I became a seasoned regular. And then life happened. I started to write for www.gastronomicslc.com and freelance for the Salt Lake Tribune and suddenly found myself eating less and less at my regular haunts. Yes I know, I can hear the worlds smallest violin playing too. Skip forward to a recent Sunday – with a restaurant reconnaissance mission scuppered by the sabbath – and Kyoto popped into my mind. Back in the day, Kyoto was always one of our dependable Sunday destinations. And here we were again, adrenaline surging as we scored a space in the notoriously busy parking lot, brushing past the precisely manicured bushes of Kyoto’s grounds and stepping inside to beaming hosts and the aroma of freshly fried tempura. The interior hadn’t change a jot. The space is the Kyoto probably etched into your minds eye, tatami booths, lots of dark wood framing and paper lanterns. The sushi bar sits in the middle of the restaurant and wait, is that, no can’t be – yes it was, chef Akira Fujii was still there too. Our server quickly brought menus, a runner brought water and then even more nostalgia flooded back when a stoneware jug landed on our table – containing Kyoto’s house brewed soy sauce. The first real evident change was Kyoto’s menus. 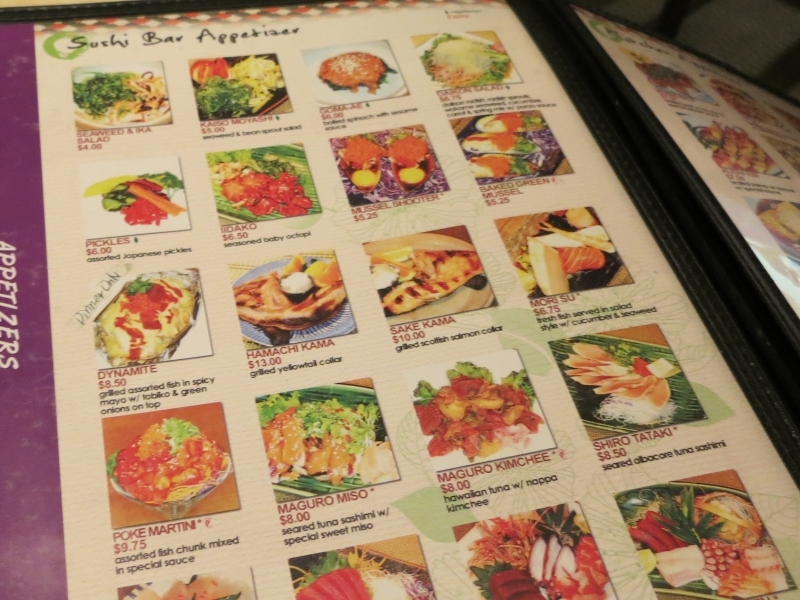 While you will still find the old menu filled with favorites such as teriyaki, tempura and sukiyaki you’ll also be given a newer, larger menu. 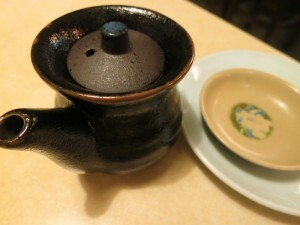 I’ll confess to my heart sinking on first peering in – every dish detailed with a helpful, colorful picture. Normally this would be my cue to make an excuse about leaving the oven on and dash towards the door. Given our history though, I owed Kyoto the benefit of the doubt and started making my way through some of the additions since my last visit. Pickles ($6.00) and Maguro Kimchee ($8.00) were up first. The pickles made a pleasant start to the meal not to mention a side snack as we waited for other dishes to arrive. 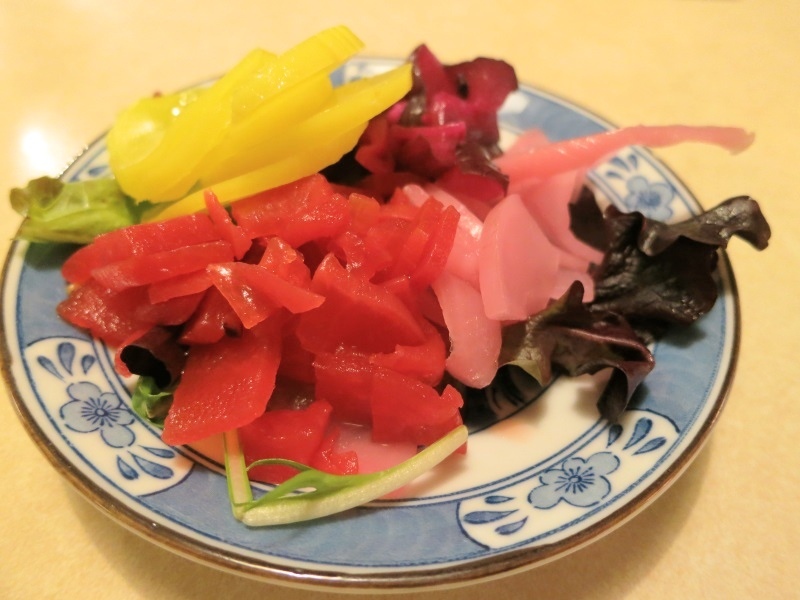 Rounds and slices of radish and cucumber – only gently pickled, none of that overtly salty or acidic nonsense, with the daikon retaining plenty of its earthiness. When I ordered the kimchee our waitress even gave us that special “congratulations you just hit the jackpot’ nod – and the dish was indeed a winner. For a mere eight bucks I was surprised by the generous amount of ruby red maguro swimming amongst the spicy and buttery kimchee cabbage. In a valley with sixteen dollar artisan burgers, it was at this point I had to pinch myself and double check the prices. Kushi Ebi Teriyaki ($7.50) was next and every restaurant that’s tried to charge me the same price for two or three shrimp – you know who you are – go to the corner and count to ten. No, actually count the number of shrimp on the plate below and how many dollars they cost – and then count to ten. 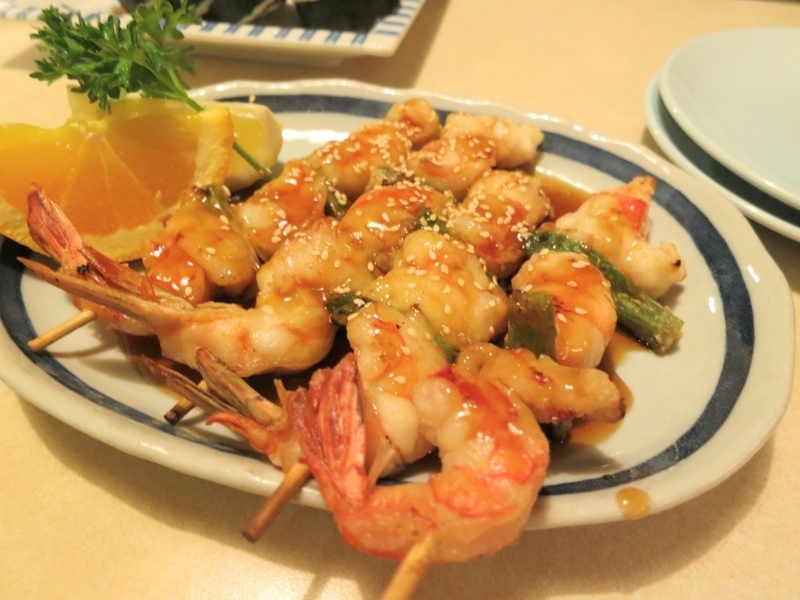 The shrimp here were delicately grilled, still with plenty of snap and then coated in Kyoto’s house teriyaki sauce that I’ve always mused must use honey given its viscosity. 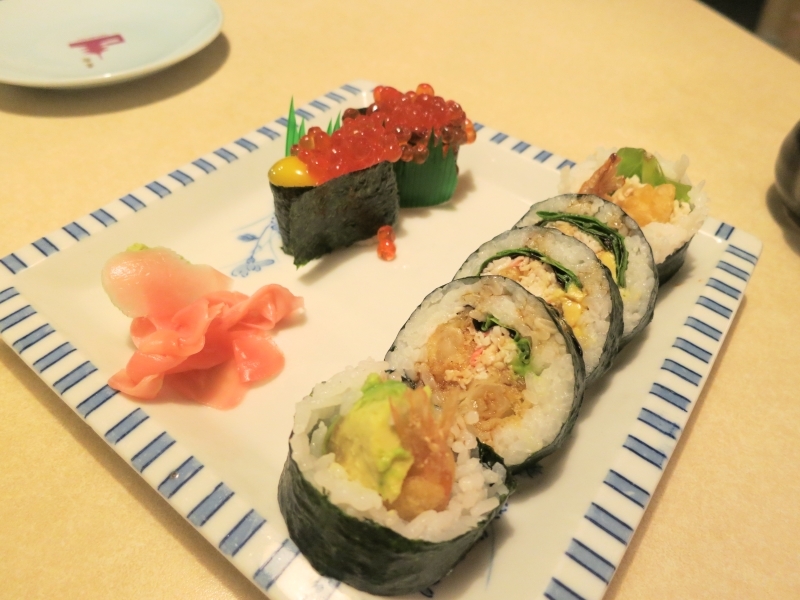 Onto the sushi then, and first an Ebi Tempura Roll ($7.50) with Ikura Nigiri (ordered with an extra quail egg) on the side ($5.00). 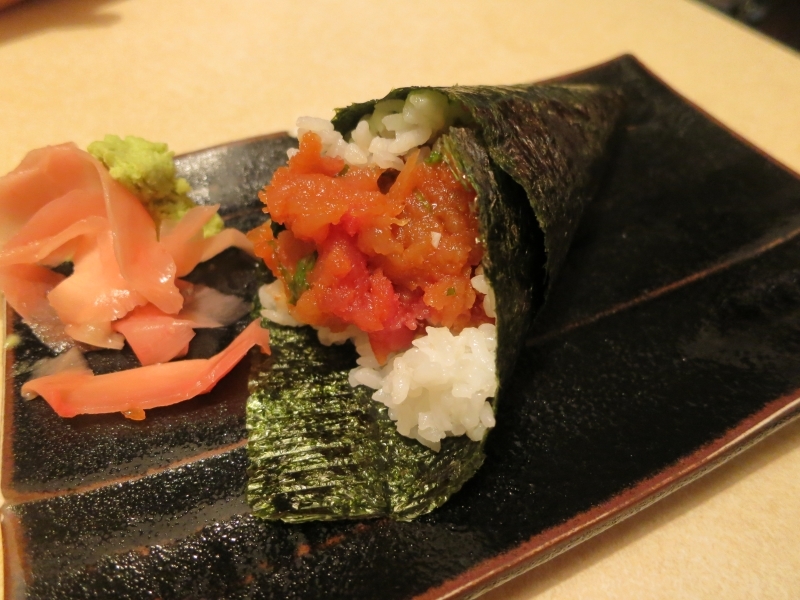 And for good measure, why not a Spicy Tuna Handroll too ($6.75). Both items were as solid as I remembered from days gone by. The ebi tempura still warm from the fryer and the briny salmon roe a delight with the creamy quail egg. 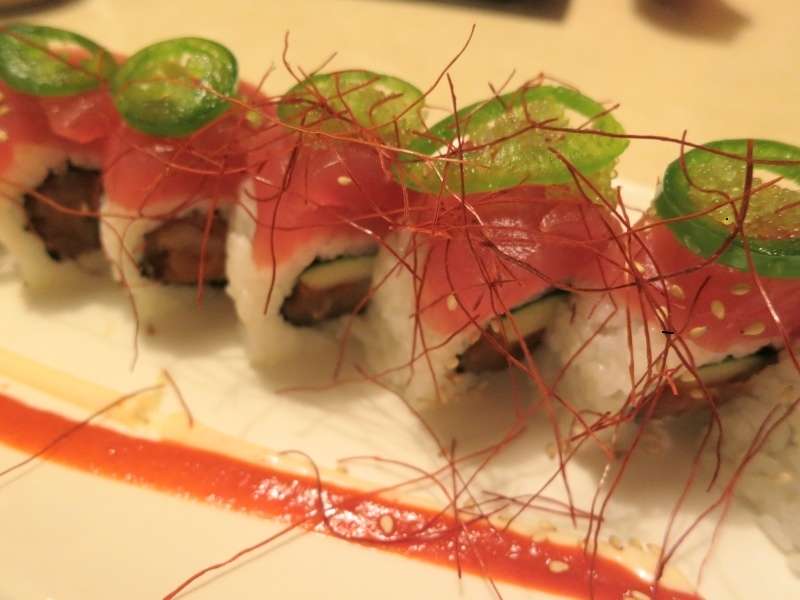 Nostalgia sated, I wanted to a newer addition, the Hot Samurai Roll ($14.00, yellowtail, spicy tuna, scallion and cucumber topped with tuna, wasabi tobiko, jalapeno and sriracha) my next target. A very well constructed roll, very pleasant on the eyes and eminently enjoyable. Having an asbestos lined mouth though, I personally didn’t find the roll all that spicy. Encouraged, we decided to hurl ourselves completely down the rabbit hole and order up the thoroughly apocalyptic ‘Dynamite’ ($8.50). 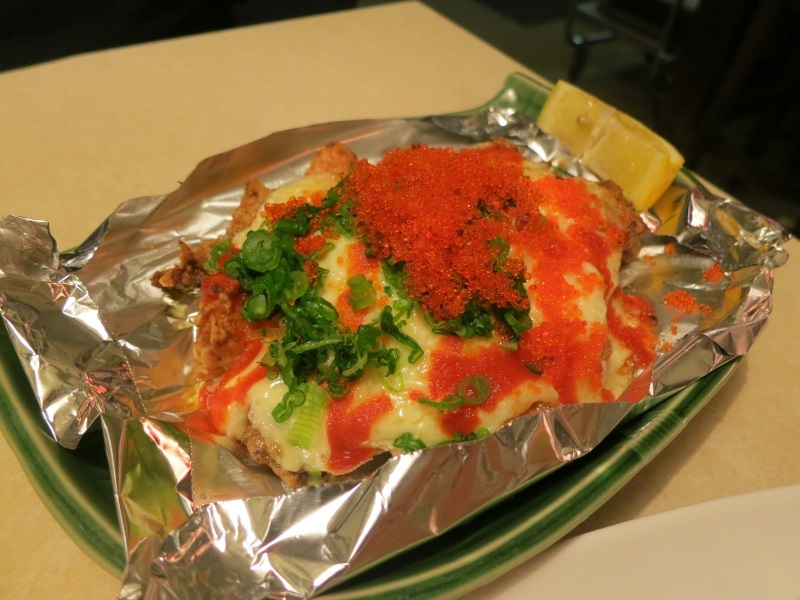 An assortment of deep fried fish comes not just bathed, but drowned and entombed in rich, spicy mayo before being laid to rest with with crunchy tobiko and green onions. It’s Sylvester Stallone turning up at a chess competition and demanding everyone play something easier like checkers. In sheepishly ordering this from our waitress I am certain the words that came out of my mouth were “Hulk smash!”. While there’s no doubt I lost IQ points, gained a belt size and lopped 6 months of my life eating this dish – could I have three more please? A couple of days later, intrigue got the better of me, I had to know more about Kyoto’s evolution. The menu had started to change on my last visit a couple years back, but I felt more was at work. After some brief digging I found myself on the phone with the amiable Will Keesen, GM at the La Salle Group – which also owns downtown’s Oasis Cafe, Faustina and Golden Braid Books. Keesen recounted a tale from late 2012, where founders Sam & Yoshiko Tada sought to sell the business – under the caveat any new owner would have to retain staff and respect those special elements that make Kyoto what it is. Bowled over by the opportunity to take control of such a prestigious restaurant, the La Salle Group was only happy too happy to work with the Tada’s on their transition wishes. That’s why in addition to Akira at the sushi bar you will still see servers Michiko, Keiko and Yasuko – delivering heaping pile after pile of beautiful tempura – just as they have been since the day the restaurant opened in 1984. Keesen made a point of stressing that the La Salle group would strive to be respectful stewards of what is arguably now a culinary landmark in SLC. Much work has gone into the back of the house, replacing mountains of paper and pens with modern day electronic POS systems. In the upcoming weeks I’m also told there will be a refresh to the beverage setup, with sake flights making an appearance. As I write, the La Salle Group have been owners of Kyoto for a year. From what I experienced they look set to take the restaurant forward while respecting its history. Kyoto is 30 years in the making this year, I’m eager to see what the next 30 holds. Rating: 4 out of 5. Reviewed by Stuart Melling on February 16th 2014 . I’ve read your comments before and while I don’t always see eye to eye with any critic, I truly respect and appreciate your reviews. Thank you so much for taking the time to visit a true icon restaurant in Salt Lake that simply is a hit with a huge following, simply because the original owners and their amazing staff deeply cares and is passionate about their craft and always have been. Taking credit as new owners would simply be ridiculous as the real challenge is only to keep everything in tact and make sure we never lose the magic. Thanks again for this and all you do to propel the independent restaurant business in our market. That’s very kind and the pleasure is all mine Joel. I’m looking forward to dining at Kyoto for many more delicious years to come and seeing how you guys balance the old with the new – I am sure it will be great.